What have Smart Cities done for us? What does "success" mean at HSBC? Cyberport is a creative digital cluster on the south side of Hong Kong island. We talk to College of Business alumni Dr Toa Charm (DBA), Cyberport's Chief Public Mission Officer, and Karen Wu (MA Global Business Management), Head of Corporate Marketing and Communications, about Cyberport's mission to nurture digital industry startups, and Cyberport's new University Partnership Programme. 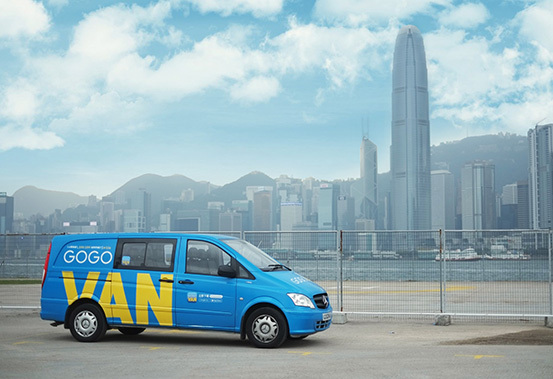 When Alibaba Group announced that they were going to fund GoGoVan in May 2016, it was clear that the newgeneration logistics company was hitting the big time. Chosen alongside fellow startups YEECHOO, and Shopline from more than 200 Hong Kong companies, GoGoVan is all set to further disrupt the traditional logistics industry. Less well known is the role that Cyberport has played in nurturing GoGoVan since its foundation in 2013. As Chief Public Mission Officer Dr Toa Charm says: "We are big supporters of entrepreneurial programmes, and GoGoVan– along with Shopline – were early Cyberport successes. Previously these kinds of programmes were only organised by people like ourselves, but now you see corporates like Alibaba getting involved." Another big success is Snapask in the education sector, an instant tutorial programme. Answers can be provided within 15 seconds from instructors in Hong Kong. This is the magic of the digital entrepreneur – solutions which straddle the digital and human worlds. Cyberport has been a landmark on Hong Kong Island's Southside since the early 2000s. Initially, critics described it as more of a residential than a technology hub. But change is afoot. As we talk, looking over the ships sailing out to sea, there is a sense that Cyberport is finally beginning to fulfil its mission of nurturing digital industry startups and entrepreneurs. "We help prep Hong Kong startups to grow and get extra mileage in international accelerator programmes. We also bring international accelerators so Hong Kong can work with global talents," says Charm, outlining the game plan. "We work directly with Hong Kong universities through our new Cyberport University Partnership Programme which links with Stanford Graduate School of Business. It's a great way for students to kick start a career in FinTech (financial technology)." One recent Hong Kong arrival is Wearable IoT World, an accelerator solely focused on the Internet of Things and Wearables ecosystem, which is an essential ingredient of the Smart City. Dr Charm clearly finds the startup challenge fascinating. "We are trying to build an ecosystem to help the whole of Hong Kong. We need more quality startups who make use of new technology to add to the value chain." Key players are existing corporates, government, organisations such as Cyberport, as well as the startups themselves. "If corporates don't see the use of the new technology, then the startup will die. Bridging the ecosystem is a joint effort between all these players." Charm sees the future as challenge-based, and increasingly catalysed by the private sector. "Corporates will share a problem. Young talents will compete, get funding and develop solutions. In some cases the corporates may get equity in return. The goal here is to arrive at brilliant solutions for existing problems." With expert overview, Charm swiftly defines the Smart City: big data, IOT, wearables, education tech, electronic commerce, and all in an international context. Cyberport is part of the regional Smart City Consortium, and he expects to see more concrete action in the next few years. "There will be more investment in wifi and open data; better standards for exchanging data, and dealing with data privacy issues, and these are global issues." Ironically, Charm believes, parents of today's youngsters are holding onto outdated perceptions and doing their children an active disservice. "In Chinese culture we always want our kids to be doctors, lawyers, accountants. Now, we are trying to influence the culture and say tech can also be a viable career. When parents understand the benefits of tech, when we have more GoGoVans, an Elon Musk Hong Kong, and a Facebook Hong Kong we will have reached a tipping point." Cyberport provides the ideal informal environment for people to interact and bounce ideas off one another. But it also offers a lot of more organised opportunities: networking sessions, conferences, seminars, for different types of audience – from primary school to seasoned practitioners. The idea is to leverage the creativity of young people. "Say, you are in year 3 university, and you want to use open data to do something, you can apply for the Cyberport Creative Micro Fund to validate your idea. We will give a little bit of funding so that proof of concept and prototypes can be produced." As Karen Wu, Head of Corporate Marketing and Communications, puts it: "We want innovators rather than consumers. We want to inspire the next generation. We want them to start at a very young age, to have tech in their DNA. So they get behind the software, pump out code, and use tech as a means of expression." Plans are scalable and already a huge success. "Last year we broke the world record during Cyberport Youth Coding Jam 1000, bringing over a thousand Hong Kong kids together at Central Harbourfront. Many of them had been coding from an early age." For Wu, coding is critical. "Coding enables you to identify problems and make a first attempt at solving them. We were one of the early pioneers bringing coding to kids and education." Students are given practical but stimulating problems: "At Cyberport Youth Coding Jam 1000, students were given a piece of virtual land to build and connect with neighbours. They leveraged their creativity to build a smart city in virtual space with their coding skills." "We are different in so far as we don't have a syllabus and we don't need one to spark interest in coding among kids – they genuinely love it because they have the space to express their creativity in a tech way. For example, some kids built a slide in the virtual playground, and we asked why are you doing that, why are there are so many?" "It turned out it wasn't a slide but a time tunnel – so that they could travel back and forth from present to past and into future eras. They'd heard from their grandparents how music used to be stored on vinyl, then cassette tapes and minidiscs, and wanted to find out more about tech history. Kids' minds know no bounds." "The beauty of these kinds of project is that the kids are continuing these projects in their schools as extra curriculum. In this way innovation is entering the more mainstream education system."